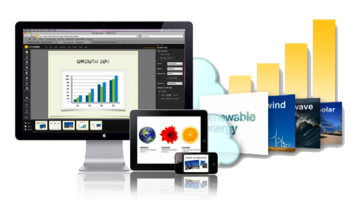 PowerPoint presentations have been utilized in almost every industry, by every business, and most likely by anyone and everyone who owns a PC or laptop computer. Why? Because it simplifies getting your message across to an audience when using images, keyword text, audio, video, and custom animations etc. 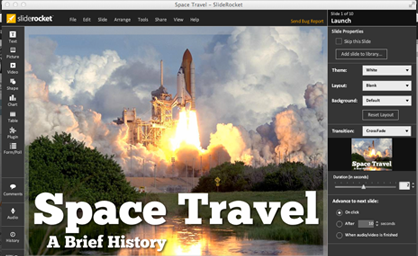 Some benefits of using an online site and tool like Sliderocket is that you can access some really cool things that they’ve created that you won’t find in your Powerpoint software. You can create some really stunning presentations and access them from anywhere online. Take advantage of sharing your best slides and assets with your target audiences. Distributing your presentations easily via email and social media, and without using a third party embedding tool, you can easily post presentations to your website. Embed live Twitter feeds, polling, and comments and even analyze and measure your presentation views using their built in analytics tools. See a live demonstration if you’d like to evaluate this tool first, but if you’re like me, you’ll probably just dive in and start creating your own presentation for your next meeting or seminar. There are many templates and custom created tools you’ll want to check out for sure. Here’s a Tour if you’re interested. Watch a SlideRocket video, or check out some of their other resources. You’ll also discover that they even have coaches available. One of their support coaches (Sogol) immediately sent me an email and when I called, she actually answered her phone. Now that’s customer service folks. Here’s a few additional items that might be of interest to you. Be sure to give this a look see, you won’t be disappointed. Getting started videos, the best of SlideRocket, etc. WOW! Brad, you did it again! You are simply incredible with the value you add to our lives every day! Thanks so much for putting this out there. I will definitely play with it and learn to use it for my next presentation.